WorldStage provided Stimulant’s experiential designers with innovative video projection solutions for two interactive attractions at the new Skyspace LA. Nearly 1,000 feet above the city in the iconic US Bank Tower, Skyspace LA is the tallest open-air observation deck in California. It has quickly become a premiere destination for panoramic, 360-degree views of Los Angeles. The US Bank Tower requires visitors to transfer between elevator banks to get to the top. Stimulant was charged with creating an exciting transition for visitors as they work their way to the grand reveal of the view and one-of-a-kind Skyslide on the 70th floor. 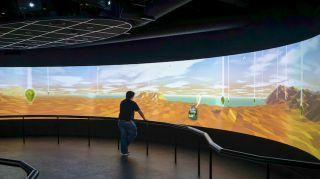 WorldStage partnered with Stimulant on the interactive 360 Landscape and Reflection Wall experiences. 360 Landscape is a 50-by-30-foot interactive projection-mapped ellipsoid space, which surrounds visitors with an abstract representation of the topography of Los Angeles as rendered from the viewpoint of the tower. Visitors trigger playful, animated graphics showing points of interest visible from the top floor. A specialized video mode features custom-produced content at up to 11520x1200 resolution synchronized across two separate walls. WorldStage designed, specified, and installed the nine-projector theater for the ellipse mural. WorldStage chose Christie Digital DWU-600-G projectors for their image quality and quiet operation. The interactive display feed was warped with ImmersaView Warp software. WorldStage also installed an audio system equipped with JBL speakers. The unique Reflection Wall is an interactive experience that uses pixels to create personalized reflective images. It captures visitors’ movements and motion and translates them into vivid graphics. WorldStage also designed, specified, and installed a four-projector, 21-foot column of video for the Silhouette Wall. It is also equipped with Christie DWU-600-G projectors. A separate Matrox controller provides LED lighting control for a custom-designed, reactive infinity mirror lighting element. For WorldStage, Josh Weisberg was the system architect, TJ Donoghue project manager, Bryan Dominick lead engineer, and Marcus Garfunkel programmer.